With help from designer Kristina Crestin, a bedroom shared by Marblehead sisters feels like a first apartment. Some siblings prefer the privacy of separate bedrooms, but the tween daughters of designer Kristina Crestin’s clients in Marblehead had more ambitious plans. The pair proposed that they sleep in one bedroom (shown here) and use the other as a hangout space. The parents asked Crestin, who was working on other rooms in the house, to help execute the girls’ vision. 1. The ruffled “Wandering Pleats” curtains from Anthropologie set the tone and draw the eye up, adding interest and color. 2. Rather than clutter the dresser with table lamps, Crestin hung West Elm “Lens” sconces next to the beds. The antique bronze finish echoes the curtain rods. 3. 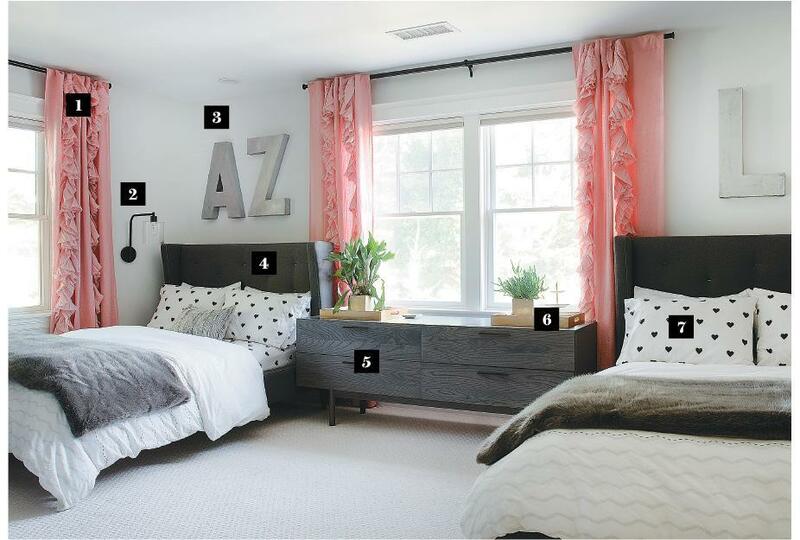 Their initials in bold, oversized zinc letters from Anthropologie define each girl’s space. 5. The low-slung “Shale” dresser by Blu Dot from Lekker Home unifies the two sides of the room, provides ample storage, and doesn’t block the window. 6. Monogrammed trays help the girls keep trinkets contained and out of plain sight. 7. Not wanting the linens to compete with the busyness of the facing gallery wall, Crestin chose matching heart sheets from PBteen for both beds. 8. “Juxtaposing an edgy black wall with feminine touches balances the room,” says Crestin. The paint color is Graphite by Benjamin Moore. 10. The seating is repurposed from elsewhere in the house, and the faceted brass side table from Crate and Barrel adds a warm glow.